Shrouded behind an impenetrable curtain of magic known as the Faering Mists, the Fading Lands are home to the Fey, a race of legendary, fiercely powerful immortals. Also called the Shining Folk for their incomparable beauty and the faint luminosity of their pale skin, the Fey are champions of Light who throughout the millennia have willingly sacrificed themselves again and again to defeat the forces of darkness in the World. Their greatest enemies are the followers of Seledorn, God of Shadows, chief among them the dark-souled Mages of Eld. The Fey used to mingle freely with other races, but after the devastation of the Mage Wars, they returned to the Fading Lands, erected the Faering Mists, and withdrew from the World. Geographically, the Fading Lands is well-isolated from its neighbors. An impassible volcanic mountain range called the Feyls borders the north and merges with an equally formidable non-volcanic range called the Rhakis which runs north and south along the eastern border. Elvia’s Valorian and Silvermist mountains protect the Fading Lands’ southern border, and the Lysande Ocean and the rolling hills of the Vanyas mountains guard the west. The only easy entrance into the Fading Lands is through the Garreval, a ten-mile wide pass leading from the mortal kingdom of Celieria between the southernmost peaks of the Rhakis and the northernmost mountains of the Valorian range. A towering fifty foot wall and the Faering Mists keep the Garreval blocked from all would-be intruders. Once a vast desert, thanks to the magic of the Fey, the Fading Lands is a paradise of legendary beauty. Dharsa – The Shining City, capital of the Fading Lands. Built of white stone, its many towers capped by gleaming gold spires and domes, Dharsa rises like a jeweled crown from the rich greenery of its surrounding, forested hills. The city itself is situated on a ring of five outer hills, all circling a larger central peak, upon which is build the immense, shining palace of the Fey king. Breathtakingly beautiful, Dharsa’s graceful white and gold buildings soar amid terraced gardens, and trees laden with scented blossoms and plump, shining fruit. Water cascades from breathtaking fountains and artfully arranged cliffs, feeding streams that wind down the hillsides and feed into the wide, shining ribbon of the river Faer. The Hall of Scrolls, the Warriors’ Academy, and the Hall of Truth and Healign, are all located in Dharsa. Elverial – Elvish-inspired woodland village, nestled in the forests at the base of the Silvermist mountain. Birthplace of Rainier vel’En Daris’s mother, Kiaria. The mountain streams of Elverial feed the Crystal River that runs across the southern Fading Lands and pours into Tairen’s Bayat Tehlas. Lissilin – Light of the East, an abandoned Fey city in the eastern desert of the Fading Lands. Once a thriving Fey city, the magic of Lissilin’s Source died, and the Fey inhabitants abandoned their homes. Blade’s Point –Â Perched on the craggy promontory of the same name, Blade’s Point is the location of the great tairen-fired forges of the Fey, where Fey steel is created and shaped into armor and weapons by master craftsmen. Cresse – Located at the mouth of Tairen’s Bay, Cresse is the location of the legendary Ivory Towers of Cresse, where the golden tairen Fellana first met the Fey king Sevander. Chatok – the great war fortress guarding the northern mouth of the Garreval. Chakai – the great war fortress guarding the southern mouth of the Garreval. Dunelan – An abandoned Fey mountain city nestled among the highest peaks of the Rhakis on the shores of Crystal Lake. Fey’Bahren – A cave-riddled volcano that serves as the last remaining tairen’s lair, home of the Fey’Bahren pride. Sohta – A mountain city situated at the mouth of pass of Reven Oreth, a narrow, treacherous pass that leads through the Rhakis mountains and through the gauntlet of Kiyera’s Veil into Upper Orest in the kingdom of Celieria. Tehlas – Before the Mage Wars, Tehlas was a thriving port city, tropical and cosmopolitan. 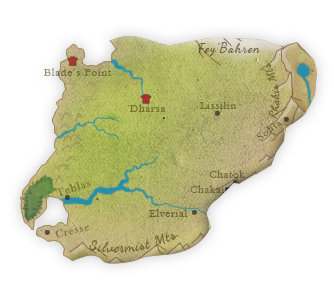 Elfeya v’En Celay and her brother Tajik vel Sibboreh were born and raised here. After completing his truemate bond with Elfeya, the famous Lord Death, Shanisorran v’En Celay, retired from the ranks of Fey warriors and settled in Tehlas with his mate, becoming one of the most celebrated chatoks (mentors) ever to teach at the Tehlasian Warrior’s Academy. The Fading Lands is only one of many kingdoms in the world of Eloran. Peopled by races both mortal and immortal, magical and not, these countries all have their part to play in the history and ni the future of Eloran and the Fading Lands. Celieria - Bordered by the Pereline Ocean to the east, and four of the World's most powerful magical races to the north, west, and south, Celieria exists as a buffering island of humanity in a sea of magical and immortal beings. Ruled by a King whose ancestors include a powerful Fey shei'dalin, Celieria has long been a close ally of the Fey. For a thousand years, the alliance stood strong and unchallenged, but times are changing. Distrust of the Fey is growing. Elvia - A land of deep woods, fertile fields, and majestic forested mountains, Elvia serves as home to a race of immortal beings who live in harmony with the World and all its creatures. The Elves closely resemble the Fey in appearance except for their tapered ears and magical golden luminescence. The Elves are woodsmen, hunters and bowmen of great renown. They are led by their prince, the powerful Seer, Galad Hawksheart, Lord of Valorian, whose home lies in the heart of Deepwood, and by his twin sister, Illona Brighthand, who lives in the cloud forests of the Silvermist mountains. The Elves follow an ancient and complex prophecy called The Dance, through which it is said all the secrets of the World can be revealed. The Elves have historically been one of the staunchest allies of the Fey, but Fey distrust over Elvish manipulations in the service of their Dance have caused a schism between the two powerful, immortal races. Eld- The dark forests of Eld border Celieria to the north. Eld is inhabited by a race of long-lived mortal beings ruled by powerful sorcerous Mages who devote their lives to mastering the darkest magics of the world. The Mages are ruled by the Mage Council, which is headed by the High Mage of Eld. One thousand years before the events that begin in Lord of the Fading Lands, the High Mage of Eld, Demyan Raz, ordered the assassination of King Dorian I of Celieria and his Fey-born queen, the shei'dalin Marikah vol Serranis, twin sister of the legendary Fey warrior Gaelen vel Serranis. That act sparked the Mage Wars. In the vaccuum of power left by the death of Raz, a brilliant and powerful young Primage, Vadim Maur, gained reknown after a series of exceptional military coups. Maur leveraged those successes, a bold new vision for restoring the greatness and might of Eld, and his own ruthless cunning, to catapult himself to power. After the Scorching of the World, he claimed the Dark Throne of Eld as his own and became the next High Mage of Eld. Danael - The groves and marshes of Danael serve as home to an elusive race of beings called the Danae. Mortal lore is full of caution about Danae tree and water spirits who delight in luring intruders to their doom. Feraz - This harsh desert land is home to ferocious warriors, the Feraz, and the powerful dark Feraz witches who govern them. Feraz is an historical ally of the Mages of Eld, and an historic enemy of the Fey and the Elves. It was a Feraz assassin, in the employ of the High Mage of Eld, Demyan Raz, who slew Celieria's King Dorian I and his Fey bride, Queen Marikah vol Serranis Torreval, the beloved twin sister of the fearsome Fey warrior, Gaelen vel Serranis. That event sparked the Mage Wars. The Pale - A frozen wasteland of ice and snow, the seemingly inhospitable lands of The Pale are home to the magical and reclusive race of shapechangers, the Sief. Mera - Shrouded in fog and protected by impassible reefs, sailors steer clear of Mera and its dangerous waters. Seafarers' lore contains many a tale of Mera sea monsters swallowing ships whole and entire crews disappearing in the island's fog never to be heard from again.